The U.S. Navy says one of its commanders will lead a new international force to battle pirates off the coast of Somalia. More than 20 nations are expected to take part in the mission once it is fully under way later this month. 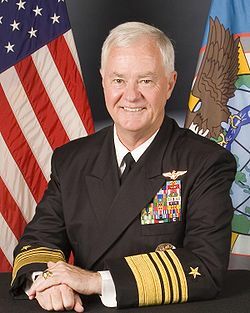 The announcement Thursday by U.S. Navy officials in Bahrain did not list the countries participating, but said the force will be headed by U.S. Navy Rear Admiral Terence McKnight. Merchant fleets have been calling for a stronger military response to pirates after a sharp escalation in attacks last year. At least 111 ships were attacked and more than 40 of them commandeered. It is not clear whether the new anti-pirate force will have any expanded powers to battle pirates. Iranian state radio says Iran has sent a warship to the coast of Somalia to protect its cargo ships against piracy. The Saturday report says the ship has arrived in Somali waters. 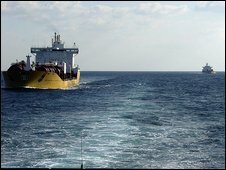 The Iranian ship joins vessels from the U.S., Denmark, Italy, Russia and other countries in patrolling the Gulf of Aden. The gulf leads to the Suez Canal and is the quickest route from Asia to Europe and the Americas. China also has said it is sending warships to the region. Pirates have made an estimated $30 million hijacking ships for ransom this year, seizing more than 40 vessels off Somalia’s 1,880-mile coastline. In November, a cargo ship operated by Iran was hijacked off the coast of Somalia, the second since July. China’s decision to send warships to battle pirates off Somalia — taking on a job that involves cooperating with other nations and possible combat — is a cautious step toward more engagement by Beijing. Though China has a huge global commercial maritime presence, the People’s Liberation Army Navy has primarily focused on defending China’s coast and, until now, limited operations abroad to port calls, goodwill visits and exercises with other navies. China has never sent military forces overseas other than as part of a U.N.-mandated peacekeeping mission, according to Bonnie Glaser, a China specialist at the Center for Strategic and International Studies in Washington. A Foreign Ministry announcement Thursday that China was making preparations to deploy warships followed a unanimous U.N. Security Council vote this week authorizing nations to conduct land and air attacks against pirates. The Council acted as piracy has taken an increasingly costly toll on international shipping, especially in the Gulf of Aden, one of the world’s busiest sea lanes. Spurred by widespread poverty in their homeland, the pirates have made an estimated $30 million hijacking ships for ransom this year, seizing more than 40 vessels off Somalia’s 1,880-mile (3,000-kilometer) coastline. “There will be a significant peacekeeping operation (in Somalia),” the source said, but did not reveal the scale of the mission. China will tell a United Nations Security Council meeting this morning (Beijing time) that “we wish to work with others to reach a positive outcome”, a Foreign Ministry spokesman said yesterday, without confirming the status of the mission. “The Chinese government supports the international community’s decision to cooperate on the piracy problem according to international law and the UN Security Council’s resolutions,” Liu Jianchao told a news briefing on Tuesday, referring to Vice-Foreign Minister He Yafei’s meeting in New York. Naval Shps from Around The Globe Watch For Pirates. Where is China? State media suggested the force could consist of two destroyers and a supply ship, although officials did not confirm the details of the deployment. As international forces rescued a hijacked Chinese ship from Somali pirates Wednesday, state news media reports said China planned to send a naval fleet to fight pirates in the Gulf of Aden and Somali waters. Piracy off Somalia has increased shipping insurance costs, forced ships onto roundabout routes and sparked international alarm. Nearly 400 people and 19 ships are being held for ransom along the Somali coast, according to the Kenya-based East African Seafarers Assistance Program, prompting international anti-piracy operations and a U.N. Security Council resolution authorizing states to “undertake all necessary measures” to stop the pirates. 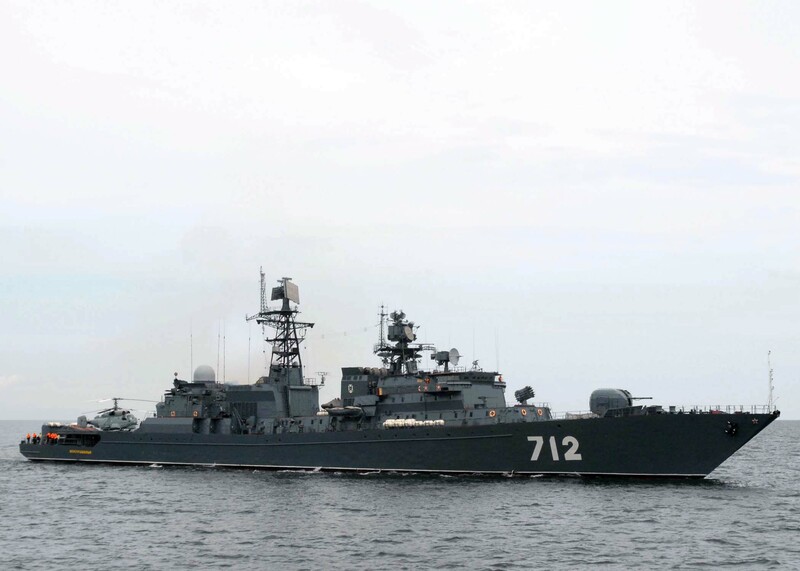 Russia’s navy says a warship on anti-piracy patrol off Somalia will be replaced soon. Russia sent the missile frigate Neustrashimy, or Intrepid, after pirates seized a Ukrainian ship carrying tanks in September. The ship from Russia’s Northern Fleet has been escorting freighters and the navy says it has helped thwart at least two pirate attacks. Navy spokesman Capt. Igor Dygalo said Tuesday that the Intrepid will remain in the region through the end of December and be replaced by a ship from Russia’s Pacific Fleet. The navy previously said it would replace the Neustrashimy with another ship and continue the Russian presence off Somalia. You are currently browsing the archives for the anti-piracy category.